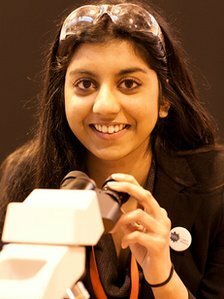 Kirtana Vallabhaneni, a Merseyside student at West Kirby Grammar School has been named as the UK Young Scientist of the Year. Kirtana Vallabhaneni, 17, beat 360 other entrants to be awarded the prize at The Big Bang Fair at Birmingham’s NEC on Friday. The student was part of University of Liverpool’s research project aimed at identifying the harmful cells that cause pancreatic cancer. Kirtana Vallabhaneni said she hoped her win could help “instill the same kind of passion I have for science in other young people”. The judging panel for the national award, open to 11 to 18-year-olds who completed a science, technology, engineering or maths project, included renowned space scientist Dr. Maggie Aderin-Pocock, Nobel Prize winning biochemist Sir Tim Hunt, and the Science Museum’s inventor in residence Mark Champkins. Dr. Maggie Aderin-Pocock said she was “delighted” with Kirtana Vallabhaneni’s work. “The country’s science and engineering industry has an incredibly bright future ahead of it if Kirtana and her fellow finalists are anything to go by,” Dr. Maggie Aderin-Pocock said. Kirtana Vallabhaneni, who was part of the project team working to isolate cells in the pancreas that can be targeted with chemotherapy, said she was “so happy” with the win. “Everything that I’ve worked for over the last year has come together,” Kirtana Vallabhaneni said. “The fact four finalists were female shows that there are strong opportunities for women in science and it proves they don’t have to follow convention and stereotypes. “I’m so passionate about what I do and I hope that with this success, I can instill the same kind of passion I have for science in other young people.